An essential map for Transmississippi and American Southwest collectors. This beautiful 1814 map, along with Pinkerton's similar map, is most likely the most important large format English atlas map of the American Southwest to be produced in the 19th century. The map depicts Mexico from the Yucatan north to what would soon become the Republic of Texas, the Louisiana Territory, and what would eventually be the U.S. States of New Mexico, Arizona, Texas, California, Nevada, Utah, Louisiana, Oklahoma and Colorado. Based largely on the maps of Alexander von Humboldt and Zebulon Pike, the general treatment of the Rocky Mountains is drawn directly from Humboldt's important map of 1811, issued just 3 years prior. The 1806 – 1807 explorations of Zebulon Pike in modern-day Colorado are also in evidence, as is Pike's Peak, here noted as the 'Highest Peak.' The name Texas appears on this map only as the name of a settlement on the Colorado River, which is here mapped twice. The Great Salt Lake is mapped according to the limited knowledge preserved from the Escalante-Onate expedition of 1776. Here both the Great Salt Lake and Utah Lake are mapped, both with indistinct borders. The Louisiana region is especially well notated with numerous annotations regarding the Indian tribes inhabiting the region and a number of advances over Humboldt – such as the correct mapping of the Arkansas River. Dated: 'Drawn and Engraved for Thomsons New General Atlas 1814,' this is the first edition of Thomson's map from the 1814 edition of the Atlas. Subsequent editions were published in 1817 and 1826. This map is an essential addition to any serious Texas, Transmississippi, or Southwest collection. Thomson, J. A New General Atlas, (Edinburgh) 1814. Thomson's New General Atlas was first published in 1817 and continued to be published until about 1821. This is the first of Thomson's major cartographic works and the atlas for which is most celebrated. The New General Atlas follows in the Edinburgh School, which eschews excessive decoration in favor of a more minimalistic fact-based cartographic vision, as established by John Pinkerton, Laurie and Whittle, John Cary, and others in the previous decades. The maps are notable for their massive scale, heavy stock, elegant color work, and easy-to-read typefaces. Although the atlas stopped being published after 1821, Thomson continued to offer 'supplementary' maps that could be tipped into the atlas as late as 1830, when he declared bankruptcy. The maps in the Thomson Atlas were engraved by Thomas Clerk, William Dassauville, Nathaniel Rogers Hewitt, James Kirkwood, Robert Kirkwood, John Menzies, George Menzies, Edward Mitchell, John Moffatt, Samuel John Neele, Robert Scott, and James Wyld. Very good condition. Some offsetting. Original centerfold. Blank on verso. Rumsey 1007.064 (1817 edition). Wheat, Carl Irving, Mapping the Transmississippi West, 1540-1861 (5 vols), #320. Taliaferro, H.G., Cartographic Sources in the Rosenberg Library, 206. Bancroft Library: G4410 1814 S6. 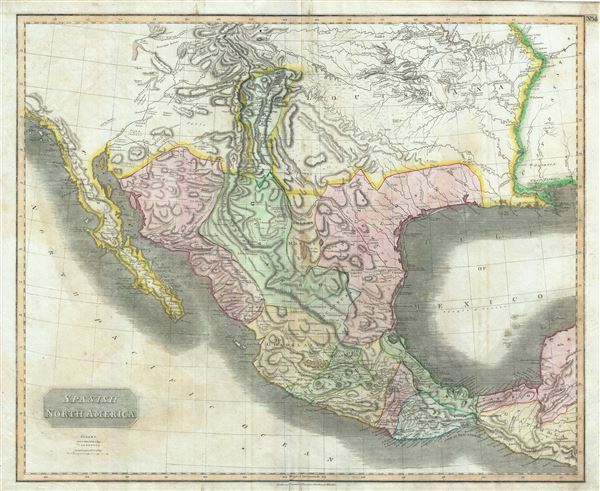 Catalogue of Maps of Hispanic America, v. 1 p. 86 (1828 edition). Phillips (Atlases) 731.